John Franklin Studstill was a wanted man. John F. Studstill, subject of previous posts, was a son of William Hustus Studstill, Tax Collector for Berrien County in the early 1900s. From about 1907 to 1909 John F. Studstill assisted his father in the tax collector’s office, until irregularities were discovered in the bookkeeping. Studstill first fled to Macon, GA where he attempted to obtain an automobile on false financial documents. He then made his way through Valdosta to Jacksonville, FL before appearing in Texas and Arkansas where he continued his financial frauds. He was finally captured at Bowling Green, FL. While being transported back from Florida Studstill escaped from custody at Rays Mill, GA.(See Embezzler Son of Illiterate Tax Collector Escapes Detectives at Ray’s Mill, GA) Previous posts ( More on John F. Studstill ~ Ray City Fugitive) told how Studstill operated his frauds and made his escape at Rays Mill, GA.
On June 6, 1909, The Atlanta Constitution reported how Studstill was captured again at his home near Milltown (now Lakeland, GA), but managed to escape from the authorities a second time. The Atlanta Constitution. 6 Jun 1909. Valdosta, Ga., June 5 –John F. Studstill, the young financier of Berrien county, Georgia, who is wanted at Macon, Ga. Ashmore, Ark, and other places on charges of forgery, today made a daring escape from Officers Shaw and Watson of Milltown. Two weeks ago Studstill cleverly eluded two detectives and escaped. Today he was discovered playing with his children. Half clad, he went through an opening in the ceiling of his house and jumped from a back window. Making use of a neighbor’s horse and buggy, he was quickly out of reach of the officers. By mid-June word was out that John F. Studstill was also wanted in Arkansas. The Atlanta Georgian & News, June 19, 1909 reported the charges. 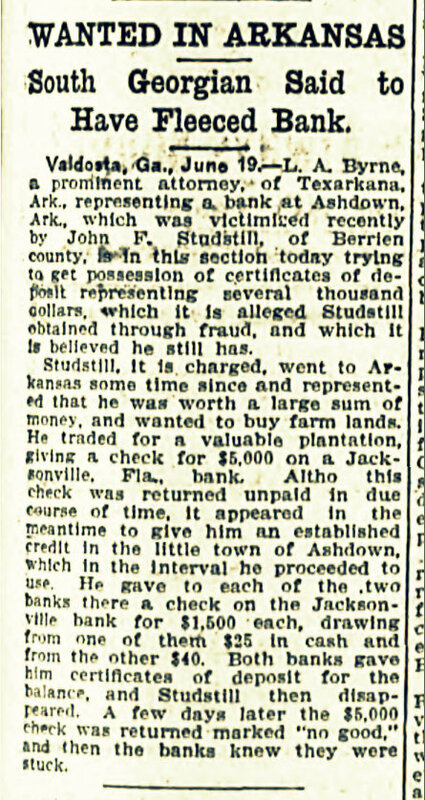 The Atlanta Georgian & News, June 19, 1909 reported that John F. Studstill of Berrien County was wanted in Arkansas. South Georgian Said to Have Fleeced Bank. Valdosta, June 19. – L. A. Byrne, a prominent attorney, of Texarkana, Ark., which was victimized recently by John F. Studstill, of Berrien county, is in this section today trying to get possession of certificates of deposit representing several thousand dollars, which it is alleged Studstill obtained through fraud, and which it is believed he still has. Studstill, it is charged, went to Arkansas some time since and represented that he was worth a large sum of money, and wanted to buy farm lands. He traded for a valuable plantation, giving a check for $5,000 on a Jacksonville, Fla., bank. Altho this check was returned unpaid in due course of time, it appeared in the meantime to give him an established credit in the little town of Ashdown, which in the interval he proceeded to use. He gave to each of the two banks there a check on the Jacksonville bank for $1,500 each, drawing from one of them $25 in cash and from the other $40. Both banks gave him certificates of deposit for the balance and Studstill then disappeared. A few days later the $5,000 check was returned marked “no good,” and then the banks knew they were stuck. It is not yet clear how Studstill managed to resolve his financial and legal issues, but he stayed in the area until his death in 1950.